Big Moon Rising…a time for hunting. I read about it in the local paper. The moon will be it’s biggest and brightest tonight. Apparently this is a rare phenomenon known as a supermoon. It happens about every 18 years or so. It was bright. The trees were casting shadows and anything glossy on the ground appeared to glow. Well, I decided to see if it adversely affects the bats. Nope. They were out in force. Some people think that nocturnal animals don’t like hunting on a full moon night. I was out in my local bat research area testing some modifications to a Anabat bat detector. The ground I was walking on had many truck loads of mulch spread around. This was creating a small micro climate where small white moths were flittering out, rising from the ground. What a boon for the bats. They were flying about 1m off the ground. I even managed to see one hover just above the mulch and tilt down and snap up an insect. I was using a torch (LED lenser P14) with the barrel setting on wide beam. It was held against my right cheek. This method is used to detect the eyeshine of nocturnal animals. Our micro bats don’t have eyeshine. While I was waiting for the bats to fly past I’d check out the immediate ground for frogs. Well, The next thing you know a bat flew up to my face and caught a insect directly in front of me. I nearly wet myself….Talk about erie… You see the glow from my torch was attracting insects. 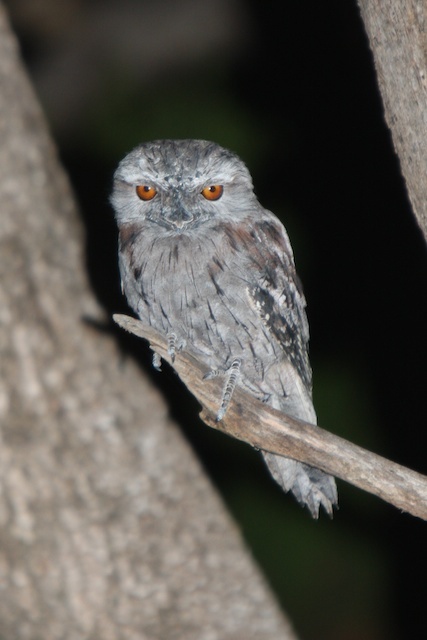 Australian Tawny Frogmouth...predates on the bats. This entry was posted in All and tagged Bats in Perth. Bookmark the permalink. 1 Response to Big Moon Rising…a time for hunting.